iOS is usually smart enough to join the last functioning wireless network used within range, but if you’re in an area with many wi-fi networks available sometimes you’ll find an iPhone or iPad is persistently joining and re-joining a network that you don’t want it to, even if you consistently toggle over to join a different router. This can be pretty frustrating, but you can typically resolve that annoyance by simply choosing to forget the wireless network and manually dropping it from the settings. 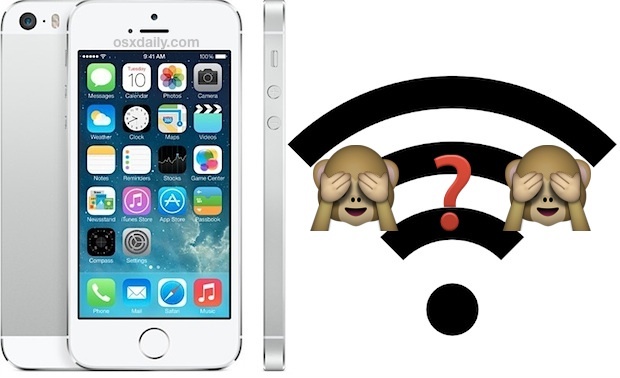 Other than preventing the joining of unwanted networks, forgetting networks can also be used as a troubleshooting trick if wi-fi isn’t functioning as intended on an iOS device, since a side effect of this is clearing out DHCP info and related caches. Yes, that means if you re-join a forgotten network, you’ll typically be assigned a new DHCP address. Unlike resetting network settings, however, you won’t lose other network details like custom DNS settings or stored wireless passwords by doing this. For the purpose of this walkthrough we’ll focus on the iPhone, but you can use the same steps to forget a wireless network on an iPod touch and iPad too. If the currently connected network is dropped, so will the wireless internet connection, meaning you’ll want to join another hotspot when possible. Of course the iPhone will just fall back onto it’s cellular data transfer at this point, but iPod touch and iPad owners without an 3G/LTE version will be left without any internet connection. The forgotten network/router will become re-listed under the secondary “Choose a Network…” category and will no longer be joined again automatically without specifically being chosen again. If you do need to join it again for whatever reason, just select it again from that section and it’ll join the trusted/preferred group again. Separately, if you find that unwanted networks are being joined without your consent (like say, if you’re an AT&T user at Starbucks), you may want to turn on the “Ask to Join Networks” feature within Wi-Fi settings. This will make a network pop-up dialog appear when networks are found within range, but it does prevent automatic joining of so-called “known” or preferred networks, which can sometimes reach beyond identified home, corporate, and school networks, and often into public hotspots that are setup by the same cellular network provider as what carrier an iPhone is contracted through. Starbucks is a good example of this, but many airports and other locations have similar service agreements with Verizon, AT&T, and presumably other providers as well. This is something that Android and Windows handles a lot better than iOS and OS X for that matter. Why can’t there be an easier “Forget Network” selection? Ignore all networks not already authorized. Agreed completely, otherwise it’s always scanning for wi-fi if you don’t have the feature turned off. There is no happy medium, seems simple to fix. Yes For me the problem is not forgetting a network its too many to choose from. just let me join the two networks i use and no need to search for the hundreds of other irrelevant ones. Waste of my time and battery. 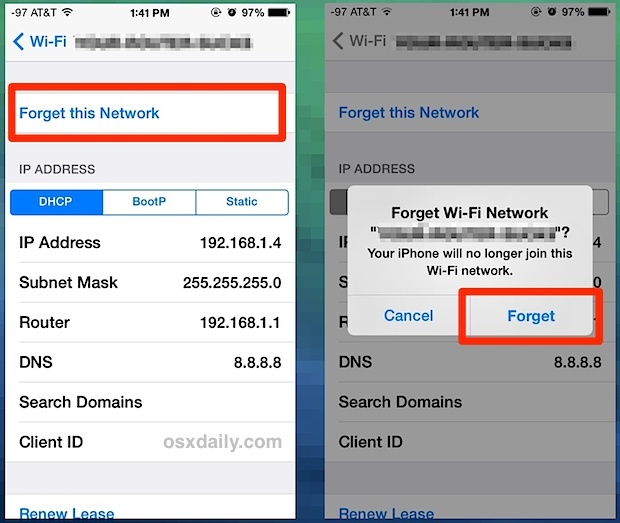 iOs 7 on iPhone 5 s will not allow “forget WiFi network” that I cannot log onto. It is draining my iPhone in no time. How to stop trying to join someone elses secure network? Can only “forget” network I am logged onto. But if I can’t log on, How do I stop iOS from trying to join??? Clif….I agree with you and I have the exact same issue. My neighbor has a new password protected wifi that us stronger than my wifi, do my iPhone and iPad keep trying to connect to my neighbors wifi. I want to block my neighbors wifi from my devices. Stu I’m having this same problem with my new ipad. Did you gets yours resolved? Ditto. I live In a townhouse and when I am downstairs I am closer to my neighbors router than I am to mine upstairs. My iPhone 5 keeps trying to join my neighbors networks on both sides of me. It is very frustrating. Forget is fine, but it seems icloud syncs these networks across devices and after I ‘forget’ one, it reappears as not forgotten within a day or so. I used to connect to an old network at work that is still functional, but there is a new, faster network and I never ever want to connect to the old network again. I have ‘forgotten’ the old network probably 100 times over the past year and it continuously shows back up not forgotten. There needs to be a ‘block this network’ option! Did anyone find a solution to this battery drainer? My iPhone connects to my wifi router then continually keeps searching for other networks. Thought ios 8.1 might offer a fix but can’t see one. Can’t forget unwanted networks because don’t get that option. We need an authorise this network function if anyone from Apple is listening and there isn’t another fix. is there any way to make the iphones AUTOMATICALLY forget the network? I have a network at work that I don’t have access to and don’t want it to show up as an option. When I click on the info button all I get is an option to “Join this network”not “forget this network”. Since I don’t have the password I can’t access it to remove it. My only option seems to be is turning off WiFi at work then turning it on when I leave. Its a pain. Its either that or every time I access a webpage it asks me if I want to accrss that network. This is fine and good info – if not selfevident. But how to get it to forget previously authorised networks that aren’t on the list – airports, hotels etc? I open the SSID I want to forget, and there is no button to forget this network, only one to connect to this network. I see no way to remove this SSID from the list of know networks. Thanks this is great, I wanted to stop the wi-fi connection on my iPhone and it worked perfect.